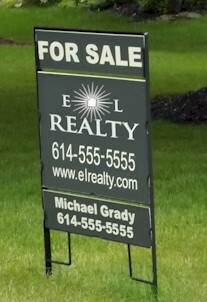 Real Estate Signage Requirements - Muirfield Association, Inc.
Signage is very limited in Muirfield Village. Real estate professionals should become familiar with the Muirfield Association Signage Policy before placing a sign on the property. The Muirfield Association Signage Policy also apply to For Sale By Owner signs. The following are excerpts from the Muirfield Association Signage Policy. These excerpts apply specifically to real estate signs and For Sale By Owner signs. The entire policy may be downloaded here. Real Estate Agencies posting a house for sale, property owner advertising a house For Sale by Owner, and/or builders posting new home construction may display signs prepared according the Definition of a Standard Sign without prior written authorization from the Muirfield Design Control Committee (MDCC). These signs are designed to blend into the environment rather than project attention. The standard sign is a metal frame that can be placed in the ground by pushing down with the weight of one person. The frame is constructed to accept standard, square or rectangular panels approximately 24" to 36" in width. The frame is constructed of angle-type steel material that allows panels to be secured by a clip or tab system. It is prohibited for a combination of such panels to exceed 7.0 square feet of face area of any one side of a double-faced sign. Colors: Signs shall be (Olympic) Oxford Brown or (Sherwin-Williams) Wolf Drive Grey (equal to Pantone #418 background with an off-white or cream (equal to Pantone #4545) lettering (not white). This color standard applies to all panel elements of the sign. Other color combinations are prohibited. Lettering: Copy must be a standard block, non-serified typeface such as Helvetica. Exception is granted where the proper name of the entity is a "stylized" typeface which is verified by use on business cards or letterhead. Logos: Graphic logo images which represent the existing identity of the Company are permitted provided that such logo does not exceed 20% of the sign face. Quantity: No more than one Real Estate or For Sale by Owner sign and/or one builder sign may be posted on any one lot. Placement: One approved Real Estate, For Sale by Owner, and Builder sign shall be placed on the front of the lot within the buildable area of the property. The sign must be oriented with the address of the property. Signage is prohibited to be located along the boulevard, at the rear of the lot, or facing the golf courses. Term: The term of such use is limited to a period ending when the house goes into contract. Open House and directional arrow signs are prohibited. For Rent signs are prohibited. Enforcement: The Association staff or appointee may remove signs that do not comply with the rules. If removed, the signs will be stored at the Association office and disposed of if not claimed after 60 days. Please contact the office at 614-889-0922 to recover the sign. Quantity and Placement: For each home that is hosting an open house, no more than three open house signs f may be placed or posted within Muirfield. One sign is permitted on the lot where the open house is taking place. Placement of a sign(s) in the Muirfield common elements requires the Association’s prior approval, and placement of a sign(s) on another owner’s lot requires that lot owner’s prior approval. Signs for the same open house may not be displayed on adjacent lots or within 150 linear feet of a sign advertising the same property. Signs must not be placed in a position that restricts or obstructs vehicular, pedestrian, wheel chair, or bicycle travel over streets, sidewalks, driveways, ramps, or curbs. Time of Display: Signs may only be displayed on the day of the open house, and at the time that the open house is taking place, up to one hour before and one hour after the scheduled open house hours. The agent holding the house open must be present at the lot for sale during times that the open house signs are displayed. Signs may be no larger than the existing the existing "for sale" signs. Signs must contain the words "Open House" and, in addition, may contain only the following: a directional arrow graphic, the listing agent’s name, the agent’s company name, the agent’s contact information. Signs may not be illuminated. Balloons, streamers, flags, or other attached or detached ornaments are prohibited. Colors: Signs must be the same as the Muirfield Sign Policy. Lettering: Lettering on signs must be a standard block typeface. Logos: Graphic logo images which represent the existing identify of the real estate agent or company showing the house are permitted.